The last little while I've been sporting a hideous sorry excuse of a poneytail. Yes, I've committed the ultimate new mom style sin... pulling the hair back looking like I just rolled out of bed. My hair has thinned out quite a bit since I had my daughter, even moreso than after weightloss surgery. My hair needs a major haircut, and I'm unsure of what I should get. Normally I would get a bob like Victoria Beckham... the longer in the front and short in the back, where it follows the jawline. My hair is quite thin and breaking in the front, that I don't think I can fully pull off that look at the moment. I'm actually debating going super short... a pixie cut. I have a round face and always was too scared to do anything super short. I was always told that my face was too fat, and that short hair is a huge NO for my face. Pixie style I'm thinking of doing. 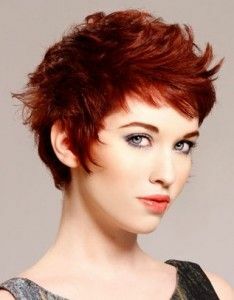 Pixie style #2 I'm thinking of. Pixie style #3 I'm thinking of - plus love the colour! So what do you think? Should I take the plunge? Right now my hair is so dull and blah, as I've just been pulling it back in a ponytail most of the time. Sometimes when I leave it down it looks nice, however, since it's thinned out it looks quite stringy at times. Ah... what to do? !